After a horrible time with Invisalign ( I just did NOT like the maintenance it required eeecckkkkk ), I almost lost hope of having straight teeth. I was frustrated and didn't care any longer until Dr. Lee gave me an ultimatum; wear braces or no straight teeth. I was mortified and yet, it worked! I put all my worries on his hands and he worked his expertise. The results are BEAUTIFUL. Dr. Lee is professional and realistic. He will get you there. My journey was long and he was extremely patient with me on my constant rescheduling and late appointments because of how far I am but the travel was worth it. I've been a long time client and the staff is always so friendly and professional. The front desk girls are wonderful as are the assistants. The manager is a huge sweetheart and you can tell she truly cares for the satisfaction of the clients. I stayed for years for a valid reason. 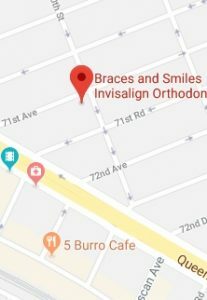 Thank you Braces and Smiles - Queens NY Best Orthodontist for Invisalign & Braces!